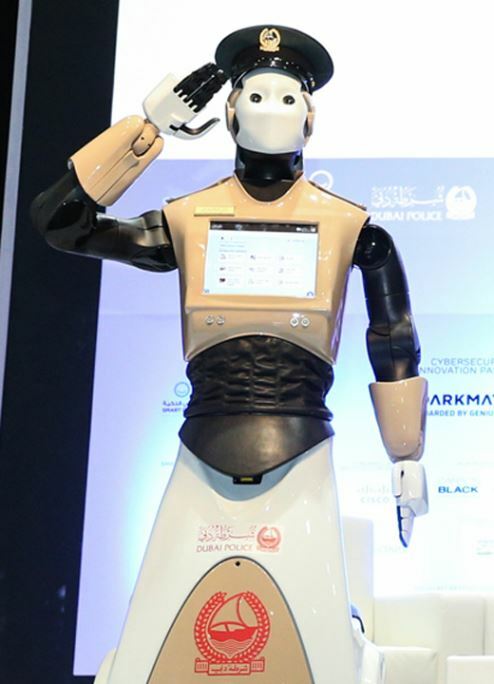 Dubai Police has launched the UAE’s first Robocop whose job is to liaise with the public. The innovation, part of Dubai’s wider ‘Smart City’ initiative, was revealed at the recent Gulf Information and Security Expo and Conference, where visitors interacted with the robotic crime fighter. The lieutenant wore a ‘Dubai Police Robot’ name tag and was the star attraction on day one of the conference. Following his public debut, Robocop's first job posting will be malls and tourist attractions where people can tap a touchscreen on his chest to report a petty crime, pay traffic fines or chat in Arabic or English. “This is the official launch of our first Robocop,” said Brig Khalid Al Razooqi, Dubai Police director general of smart services. The robot’s built-in cameras will stream video to the police command centre. “We are also working on facial-recognition systems,” explained Al Razooqi. Languages such as Russian, Chinese, French and Spanish will be added to Robocop’s vocabulary, he said. This is just the first of many Robocops planned for Dubai, with the next batch of robots to be used to tackle misdemeanours. There are also plans to introduce the world’s largest robot, which can run at 80kph. The three-metre tall robot, which will be developed over the next few years, will carry heavy equipment and will be manoeuvred by a police officer seated inside the robot. An egg-shaped robot will be used in parking areas to issue warnings about traffic violations, and self-driving motorcycles could also be developed in the future, according to Dubai Police.